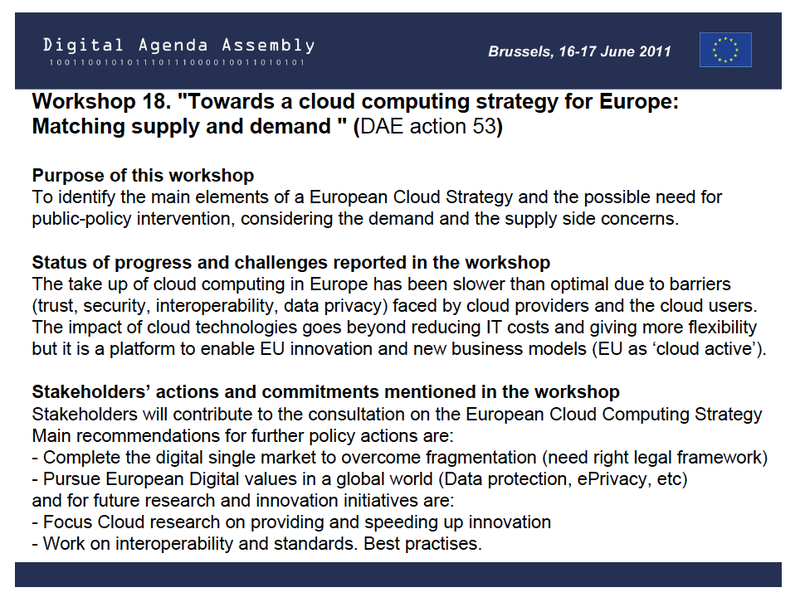 The European Commission has published the results of the Workshop Towards a Cloud Computing Strategy for Europe: Matching Supply and Demand organized at the 1st Digital Agenda Assembly. The aim of the workshop was to identify the main elements of a European cloud strategy and the possible need for public-policy intervention, considering demand and supply side concerns. The results include two reports and one video. One of the reports is the below slide with the summary of the workshop presented in the plenary session. The second report is a more complete description of its purpose, context, discussions, actions and future steps. The video is a very short interview with me, as speaker at the workshop, describing the challenges identified and the actions to address them. Cloud Computing will play a major role in tomorrow’s economy, first as innovation platform to increase productivity and competitiveness, and secondly as a new service industry that will provide many opportunities for European ICT companies. 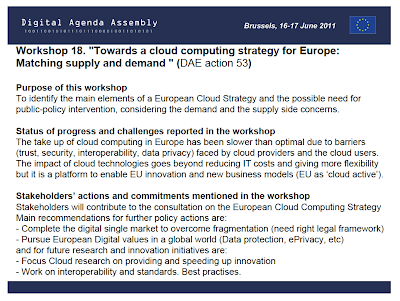 The workshop has helped identify the main areas of a European Cloud Strategy both to boost adoption of cloud computing and to lead cloud computing research and innovation. The workshop consisted of three different panels. "Challenges in Hybrid and Federated Cloud Computing" is the title of the keynote about the future of cloud computing that I am giving tomorrow July 7th at HPCS2011 and on the 31th of August at ParCo2011. The keynote describes the different cloud federation scenarios, ranging from a federation built on commercial cloud providers that offer no real support for federation to one built on data centers of the same organization where the sites are completely dedicated to supporting all aspects of federation. The level of federation is defined based on the amount of information disclosed and how much control over the resources is provided across sites. The keynote also presents the existing challenges for interoperability in federated and hybrid cloud computing scenarios, and ends with real-life examples of multi-cloud environments running OpenNebula. Would be great to meet you at these venues!. View more presentations from Ignacio M. Llorente.